04/2019 I was interviewed as a spotlight artist on Create Whimsy. Miss April perhaps?! 11/2018 We have just secured the second exhibit for Defining Moments. It will be at the Louise Hopkins Underwood Center for the Arts in Lubbock, TX Jan 3-Feb 15, 2020. The debut exhibit is at"> Visions Art Museum in San Diego July 20- October 6, 2019. 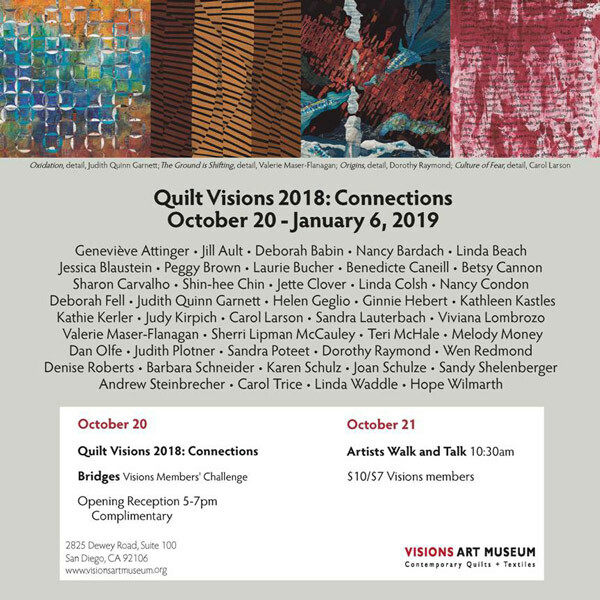 09/2018 The opening for Connections 2018 at Visions Art Museum in San Diego is October 20-21. A detail of my work Culture of Fear is featured on the evite header, far right side. Keeping Up Appearances 2 will be also featured in their online exhibit Links starting in October. 08/2018 Anti-Aging: Chemical Warfare was juried into the 2018 National Show at The Arts Guild of Sonoma by Chester Arnold. The theme for this year's show was Art in the Age of Anxiety. The show runs for the month of September. 05/2018 The Barbara Deming Memorial Fund has given me an award in support of my Defining Moments series. This organization funds feminist work that takes risks! I am so honored to receive this funding. 07/2017 My Tall Girl Series: A Body of Work has a solo exhibit at the National Quilt Museum in Paducah, KY from Oct 2017-January 2018. Concurrent to the opening of the Tall Girl Series at the National Quilt Museum in Paducah, KY, I was interviewed by the regional PBS station. You may listen to that interview here. Additionally the museum's video is here. 06/2017 My video about my work Defining Moments 12: NO Means NO at the opening of Quilt National is now on You Tube. 02/2017 My work has been juried into the Alameda County Artist Registry (CA) for years 2017-19. This allows me to submit proposals for public art commissions for buildings in Alameda County. If my proposal is selected then I will design work for said facility. It is a very exciting opportunity! 10/2016 Defining Moment 12: NO Means NO was juried into the 20th Quilt National Biennial which opens Memorial Day weekend 2017 in Athens, OH. The exhibit is open until Sept 2017 and then the work will travel for two years. 05/2016 Upheaval 2 was juried into Petaluma Art Center's Zeitgeist exhibit. The call was for artists in Northern CA and HI and 60 pieces were selected from 400 entries. The exhibit is up until July 10. My work looks stunning on an orange wall. 04/2016 I went to Washington DC for a long weekend to attend the opening events at the Textile Museum. The exhibit is up until September 4. If you are in DC check it out. You will not be disappointed. It is a very moving exhibit! 11/2015 My work Fleeing the City was juried into SAQA's Diaspora exhibit next spring at the newly renovated Textile Museum in Washington DC. The exhibit will run April 15-September 4, 2016 . Fleeing the City is part of the new collaborative series which I have been working on for two years now. It deals with the mass migration of whites from the city to the suburbs. 06/2015 My work Currents #13 was juried into a fine art competition, Art Comes Alive 2015 at the Art Design Consultants Inc in Cincinnati, OH. I attended the opening reception where $250,000 in awards were presented. I felt quite honored to have my work, the sole textile, in such awesome company! The work of artists chosen for this exhibit can be seen here. 05/2015 I continue work on Defining Moments, the collaborative series, serve on the board at the Arts Guild of Sonoma, am taking an iPad for Artists class online to learn about the myriad of artist apps and recently went to NM for a week's immersion in painting on non-wovens. 07/2014 I am hard at work on a collaborative series which will entail designing 25 large works by Dec 2017! I spent the last part of 2013 and a good portion of 2014 in R & D for the project and am now starting work #3. Already I have found it is good to start designing the subsequent piece while stitching the current one. It is an incredible challenge for me and yet I revel in that. I want to make work that challenges me and gets people to thinking! 02/2014 I am about to start another small piece for exhibit and then on to a big collaborative project that should occupy me for the next three years! 01/2014 I have been designing two pieces for an upcoming landscape exhibit. The challenge has been in making them duplicate but in different seasons. (fall and spring) I struggled with things like oak trees and perspective and frankly nearly pitched them twice. Now I am glad I stuck with them as I have a buyer for these which are in the final stitching phase. Persistence pays! Next week the huge Earth Stories project will be on its way to exhibition and gone for four years. I continue work on the large Earth Stories project which is due November 1. Upon completion it will include three pieces: two uneven edged pieces to hang together within a 72” square and a much smaller 9”x14” piece identical in design to the larger ones. It is a stimulating project not only from the theme standpoint but also involving problem solving skills to create the dimensions and tactile quality I am seeking. Two additional requirements for this project are to chronicle my progress for a journal as well as keeping images incognito until the exhibit opening. The Earth Stories exhibit will debut at Michigan State University Museum in East Lansing, MI in May 2014. Vineyard:Spring and Vineyard: Fall both sold to a new client right off my design wall. Ironically I was designing them for an entry which required the work be for sale. Since it no longer was available I did not enter the exhibit but rather installed the work in its new home. In addition I finished Keeping Up Appearances #6 as a donation to the Arts Guild of Sonoma's annual REPO fundraiser. It is a requirement that the work contain 75% recycled materials. This piece contains screen-printed text on a vintage handwoven cotton metallic tablecloth. Meg McConaghey wrote a great article on art quilts for the Sonoma Living section of the Sunday January 5, 2014 Press Democrat which featured my work both in text and image. From that coverage I garnered new collectors which was an incredible way to start off the year. My friend professional photographer Karen Preuss recently took images of me in my studio so now I have an 'official' head shot which can be seen here. My work is soon to appear in a new textile section of the online Trade Design Only Library (TODL) available to the trade: interior, architectural and design professionals. Additionally my logo is featured in an ad in the September 2013 issue of Arts & Antiques magazine. I am really enjoying my new association with the prestigious Arts Guild of Sonoma located at 140 East Napa St in beautiful Sonoma, just ½ block off the plaza. The gallery is open Wed-Mon 11 am-5 pm. I was the featured artist in July 2013, and will show my larger work eight months of 2014 (Jan, Feb, Mar, Jun, Jul, Oct, Nov, Dec). My cards will be available year-round. And the art group I formed in 2012 is thriving! Making art is such a reclusive activity so I wanted to gather together a group of mid-career artists of various media for sharing, crit and support. After much thought how to find such a willing & generous group of participants I tapped into the member directory of our local art center and hand-picked. We are now an enthusiastic group of 7. We all are loving our interactions and learning so much from each other. We remain untitled! Earth Stories debuted May 2014 at the Michigan State University Museum in East Lansing, MI. This work remains incognito until the exhibit opens. I shipped the three pieces and the journal first of February. Tall Girl Series featured in a special exhibit at the Pacific International Quilt Festival October 2013 at the Santa Clara Convention Center, Santa Clara, CA. Upheaval #7 and Upheaval #10 are in a group exhibit titled "Deux" and on the US Quilt and Sewing Expo circuit until mid-2014.